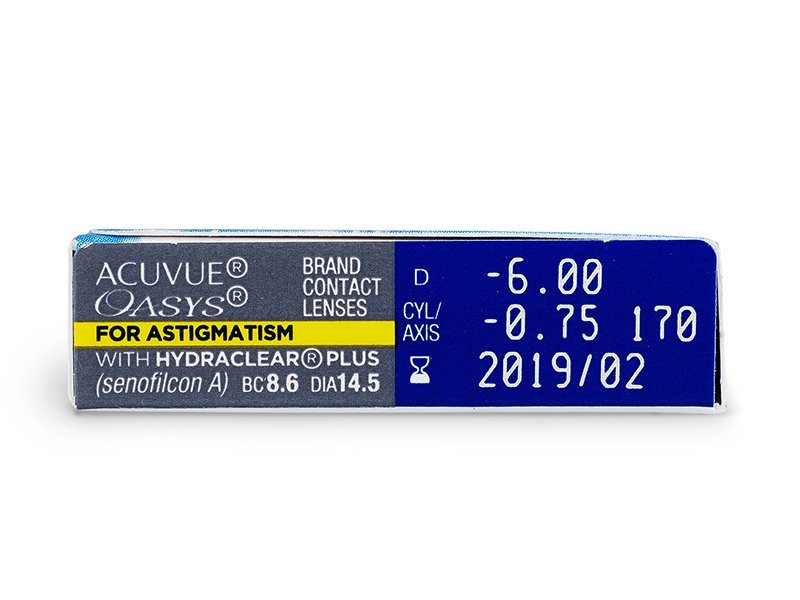 Acuvue Oasys for astigmatism are bi-weekly, toric lenses. They feature a technologically advanced stabilisation system to keep the lens in the correct position on your eye with each blink. Acuvue Oasys for Astigmatism are bi-weekly toric contact lenses produced by Johnson & Johnson to correct astigmatism. They are a new generation of lenses, continuing in the tradition of Acuvue Advance for Astigmatism. The manufacturer affirms wearers may switch from Acuvue Advance to Acuvue Oasys without needing to visit an eye specialist if all parameters of the lenses remain the same (diopter, curve, cylinder, axis). Acuvue Oasys for Astigmatism have a high oxygen-permeability and remain perfectly stable on the eye. Just like their spheric version, Acuvue Oasys, Acuvue Oasys for Astigmatism contact lenses are made from a highly permeable material, SENOFILCON B, and have 38% water content. Moreover, the lenses are equipped with the brand's patented Hydraclear Plus technology, which keeps them moist and comfortable throughout the day. The lenses' Accelerated Stabilisation Design (ASD) technology provides consistent positioning of the contact lens on the eye. This technology uses eye blinking to maintain the lens' correct cylindrical position on the eyeball. Each blink squeezes the lens into the correct position where its cylinder corrects the irregularity of the cornea. 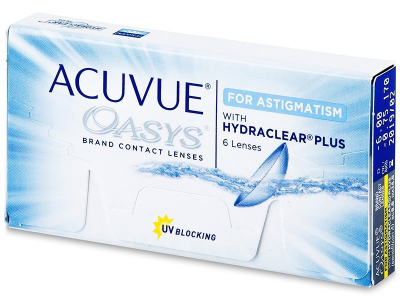 Acuvue Oasys for Astigmatism contacts are equipped with UV filters that block more than 95% UV-A and 99% UV-B radiation and protect the most important parts of eye. For better protection from UV radiation, however, it is always advisable to wear UV-blocking sunglasses when outside, in order to protect the entire eye area. 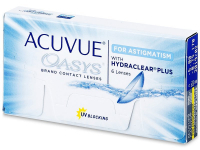 Acuvue Oasys for Astigmatism contact lenses are designed for a two-week wear cycle. They should be removed every evening and disinfected in a contact lens case with solution. The lenses are also approved for extended wear (up to seven days without removal), but only under the supervision of your eye-care specialist after a thorough eye examination. If used in this way, the lenses must be discarded after seven days. After continual problems these lenses were recommended to me by my optician. Bi-weekly lenses are perfect for me, they feel great every time I put them in and my eyes never feel tired. Hi, my left eye cylinder is -2.50 and right is -2.00. But they just do -2.25 and -1.75. How come ? 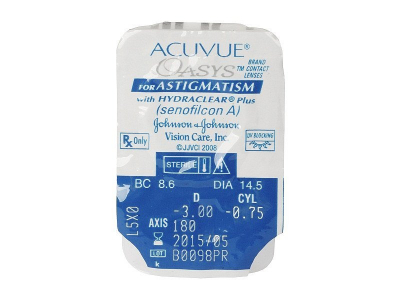 Hello there, can you tell me if you have something like Acuvue Oasys astigmatism daily lenses? Hello, can you provide any insight about Acuvue oasys astigmatism vs Air optix? Many thanks - K.
Can you wear Acuvue oasys for astigmatism contacts for a full month if you don't wear them overnight? 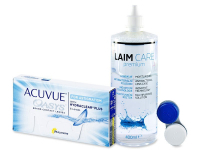 Hi David, you can wear Acuvue Oasys for Astigmatism lenses overnight, if instructed by your optician. However, they are bi-weekly lenses meant to be discarded every 14 days, so you should not wear them for a full month. Are Acuvue Oasys for astigmatism monthly lenses or fortnightly? When I started wearing them, I thought they were monthly, but perhaps I should be replacing them more often? Dear Priya, yes, Acuvue Oasys for astigmatism contact lenses are intended to be replaced every 14 days. If you are wearing them overnight, they should be replaced every 7 days. Wearing any lenses longer than the recommended time can potentially cause vision and health problems. Very pleased to find acuvue oasys for astigmatism contact lenses cheap here. Much better price than my optician was quoting me. I'll definitely recommend these to friends. Been using these for years with no complaints. Happy to have fouhd the cheapest price around, too. Once in my eyes, these lenses are barely noticeable. Top quality, and well worth the price. Pretty pleased with your price and availability of this product. I have been told that this is a good brand for people who suffer from Asigmatism. Could you reccomend other such product. Yes this is a good product for suffers of Astigmatism which means it is no longer a barrier wearing contact lenses for astigmatism suffers. ACUVUE OASYS Brand for ASTIGMATISM, ACUVUE ADVANCE Brand for ASTIGMATISM, and 1-DAY ACUVUE MOIST Brand for ASTIGMATISM offer people with astigmatism the same exceptional fit, comfort, and visual clarity that regular contact lens wearers enjoy. 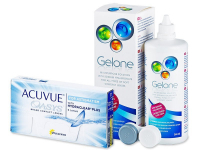 All these specialised contact lenses can be found on our website plus much more. Can you help find me suitable lens for the following prescription. Right BC 8.6 DIA 14.3 PWR -3.25/-1.75×060. Left BC 8.6 DIA 14.3 PWR -2.75/-175×120 THANKS. Thanks for leaving a comment, we have now responded via you personal email with more detailed information. My 11 year old daughter only needs contact lenses for Trampolining and only wears them 2 maybe 3 times a week to training for maybe 5hrs maximum. Dailies would be better but she needs +5.50 in her left eye therefore we had to go for 2 weekly. Could we use them for longer than 2 weeks?? I currently use purevision 2 with a base curve of 8.9 As these acuvue have a base curve of 8.6 would they be ok to use? We would always recommend consulting with your optician before purchasing lenses with a different base curve.